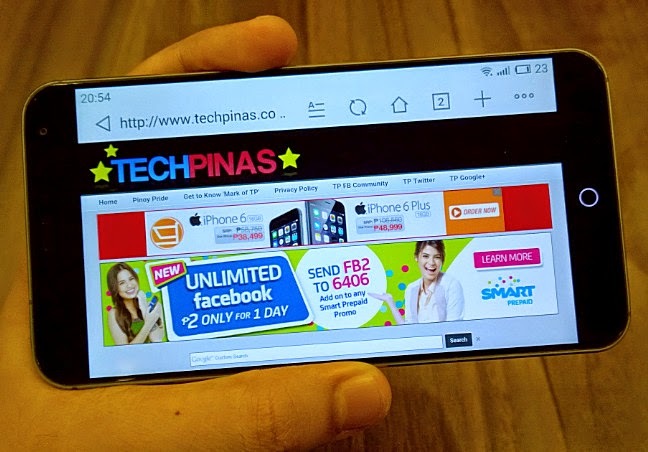 If there's anything we should know by now about Team Novo7Tech - the official distributor of THL, Zopo, and Meizu smartphones in the Philippines - it's that they always do their best to fulfill their promises. Sure, there were a couple times in the past when they weren't able to deliver on what they said because of factors beyond their control -- but from my experience in working with them, I know that they always make sure to stay true to their word. 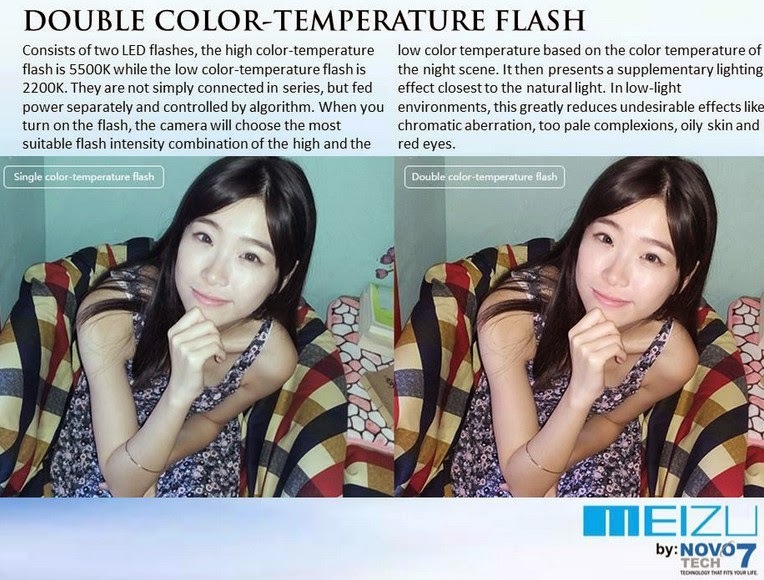 And that said, true to what Sir Adrian Lim told me in our extensive and in-depth Meizu M4 demo video, Novo7Tech is now poised to make the much-awaited Meizu MX4 flagship available for purchase by Pinoy consumers. 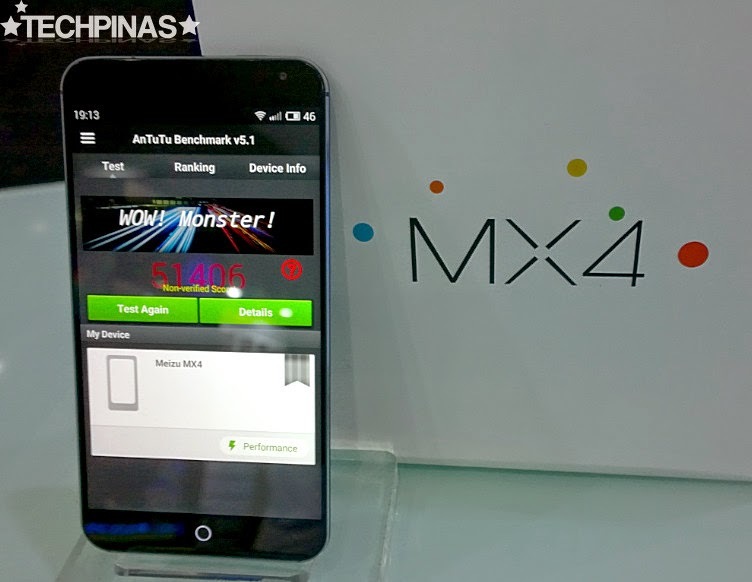 In the clip, Sir Adrian said the Meizu MX4 will be out at all Novo7Tech stores within November 2014. What he didn't say is that their team is doing everything they can to bring the handset here even sooner. 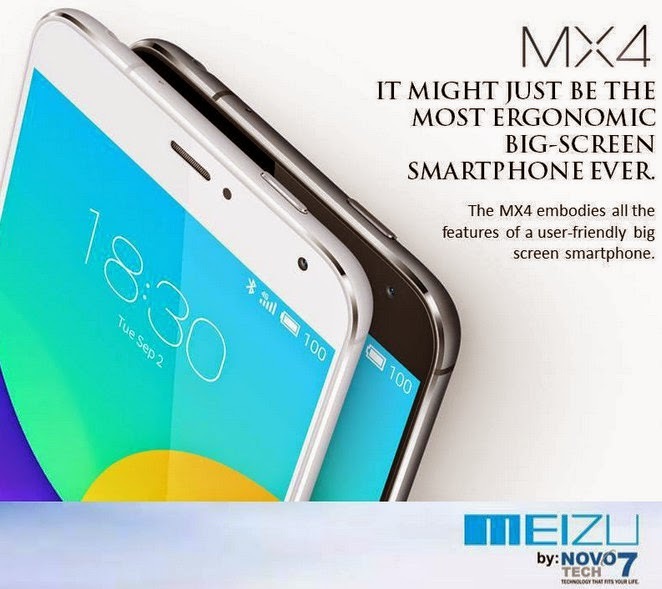 And apparently, it's a goal that they were able to achieve in the days following our interview as Meizu MX4 is indeed arriving in the country earlier than expected. Starting on October 25, 2014 - that's this coming Saturday - Meizu MX4 will be available at Kimstore, the country's most trusted gadget store. For those who are interested, you can now pre-order your unit by giving Kim a ring or sending a text message via 0922-885-9799, 0917-503-8887, or 0908-886-9799. "Mark, I'm grateful that Novo7Tech has chosen Kimstore to be their official and exclusive online partner for the release of Meizu MX4. I'm aware of the wonderful features of this beautiful and powerful smartphone and I'm happy it's now part of our product catalogue. It's an amazing and exciting release and I myself am interested in getting a unit. 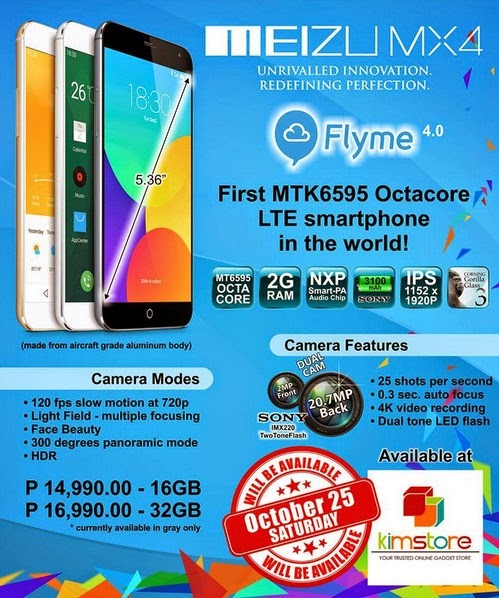 I'll probably get the 32GB variant; I think it's already a steal at Php 16,990," my friend Kim Lato shares. 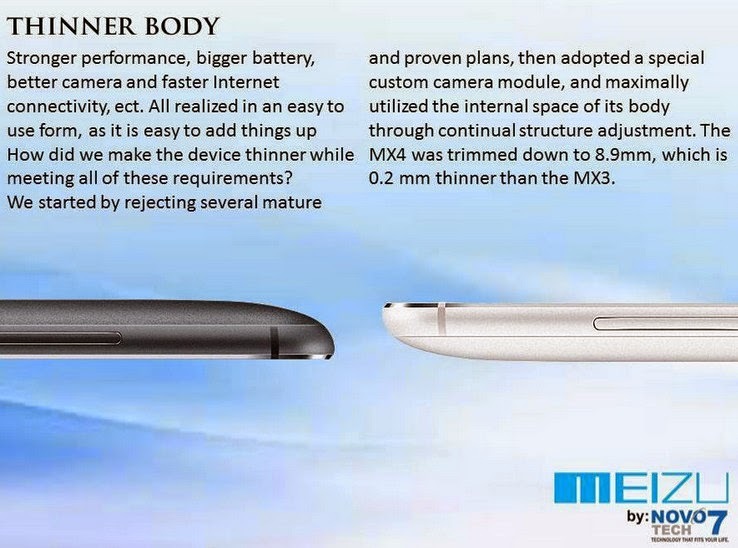 "Meizu MX4 is - as its very name suggests - the natural follow-up to the MX3, which in itself is a great device. 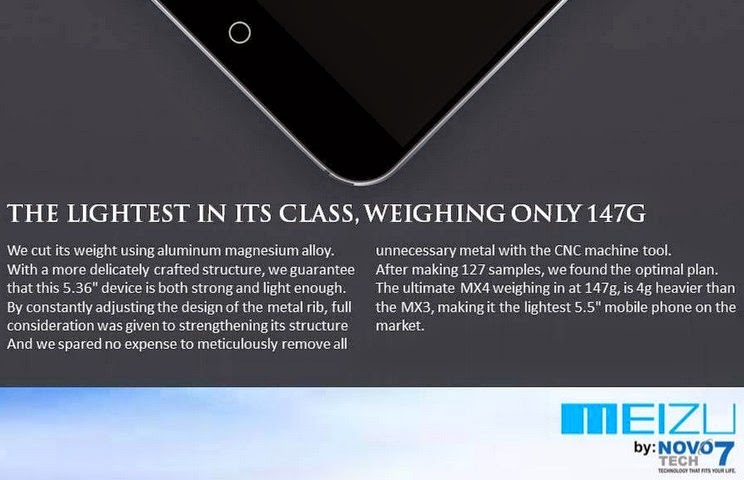 Measuring just 8.9 millimeters at its thickest point and flaunting a real metal frame, Meizu MX4 is equipped with a 5.36-inch 1152 x 1920 pixels IPS display (slightly wider than the 1080 x 1920 pixels screens we find on most smartphones these days) underneath scratch-resistant Gorilla Glass 3, a 20.7 MegaPixel autofocus camera with Sony IMX 220 lens, Two Tone Flash and Image Stabilization, a 4K video recorder, and a rather hefty 3,100 mAh Li-Ion battery pack." As you can see, tt looks great on the outside, but it's what's inside that makes the Meizu MX4 a true beast of a release. This handset is one of the first devices to be powered by MediaTek's new Octa Core chipset with Big Little Technology, the MT6595 which incorporates a Quad Core 2.2 GHz ARM Cortex A17 CPU plus Quad Core 1.7 GHz Cortex ARM A7 CPU and PowerVR H6200MP4 GPU, and supports LTE connectivity. 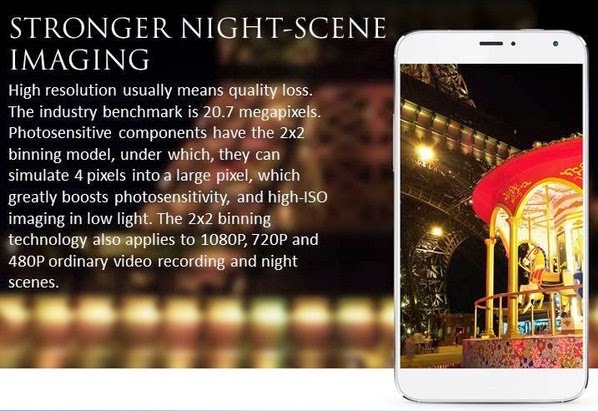 This SoC - complemented, in this case, by the device's 2 GB of RAM and 16 GB of ROM - is believed to be able to match if not altogether surpass the performance of more expensive chipsets like Qualcomm Snapdragon 801 (and perhaps even Snapdragon 805) as reflected in the MX4's ultra-high Antutu Benchmark Score.